Summer is the season for party food and with a few more days left in the year many of us are preparing for New Year's Eve. I hear from many food lovers to post recipes with aubergines (eggplants) and here we go! This dip is traditionally cooked as a vegetarian dish with eggs. The Caspian region is famous for this dish. 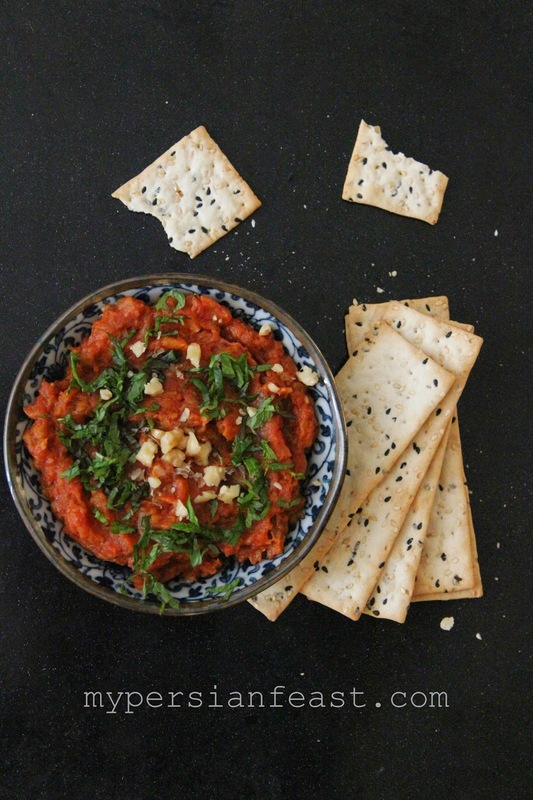 I decided to go against tradition and tweak the recipe to make a dip for this party season. A quick post for today to wish you a very Happy New Year! Prick the aubergines with a fork and place them directly over an open flame (gas stove, BBQ or charcoal BBQ) until the aubergines are completely charred; skin is blackened and soft. 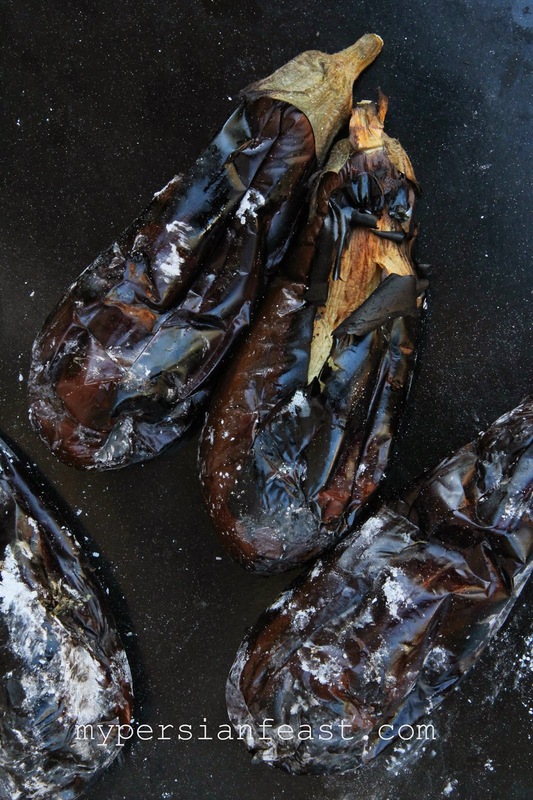 Allow the aubergines to cool and remove the skin. Process in the food processor until smooth. Heat olive oil in a fry pan and add crushed garlic. Once garlic has browned, add the tomatoes. Stir until the tomato pieces become soft. Add the aubergines and tomato paste. Continue to fry for about 5 minutes. Stir in the walnuts and chopped mint. Serve the dip cold with flatbread. pricking the eggplant is not a traditional and practical way to grill them, As you will loose the water and flavor. Dear Hanif, Thank you for your feedback. Your comments regarding the original recipe is correct and as you may have read in the blog post, this recipe is not traditional and neither it is a complete dish (hence no eggs). It is simply a dip with smoked flavour hence, we have pricked the eggplants. We have put our own spin on it and created a dip based on the original recipe. Please note we are very well aware of "aghooz tare" and have not confused the two dishes. You may have also noticed that most of our dishes are not traditional as it is not something we are focusing on. Thank you once again for taking time to write to us.